Many thanks to Claudia Robinson of Luxury Reading for a thoughtful review of Rebecca Johns’ historical novel The Countess. Claudia gives it 5 out of 5 stars! “Johns’ ability to mesmerize with words, to portray such vivid and heinous crimes with an unbiased compassion and passion is what lends perfection to this story,” Claudia suggests. “We see a woman rather than a monster, first, which allows the reader access into what has become, undoubtably, one of the most bloody moments in history. Only towards the end – with Erzsébet’s fervent denial of any wrongdoing – are we openly invited to review what we know, and realize we’ve been hypnotized by Johns into (almost) accepting Erzsébet’s behavior as warranted discipline. Therein lays the greatest horror of all. Human nature is fragile, and to be so close to such atrocities – apathetically, even, at times – is absolutely terrifying. Luxury Reading is a site dedicated to book reviews and giveaways, a great place for bibliophiles and bookworms! Visit Rebecca online at RebeccaJohns.com and follow her blog at illiterati.typepad.com. 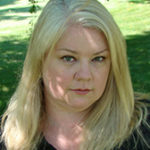 REBECCA JOHNS is an assistant professor of English at DePaul University and a graduate of the Iowa Writers’ Workshop. Her first novel, Icebergs, was a finalist for the 2007 PEN/Hemingway Award. The paperback edition of her latest novel, The Countess, is available wherever books are sold.